I want to ask, how did I get dragged into this? But the thing is, I sorta dragged myself into this. And what is "this"? The continuing Xiaxue-Gushcloud saga, of course. On Saturday, Xiaxue (or Wendy Cheng) published a sequel to her Big Gushcloud Exposé. Once again, local netizens went a little nuts over it. But a bit less nuts than before because after all, it's just a sequel. Many were also too busy hunting down the rude Chai Chee taxi passenger to crucify. So a website called MustShareNews provided a summary of Xiaxue's second Gushcloud exposé as well as some commentary. 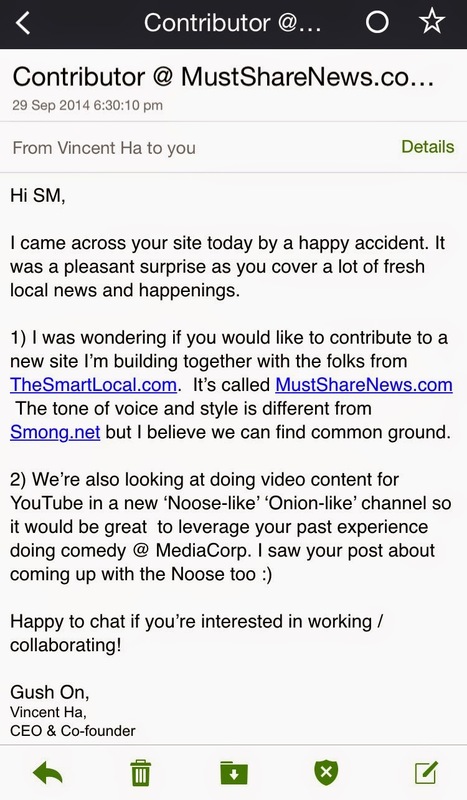 Then yesterday, another website, Mothership.sg, commented on the commentary by MustShareNews. 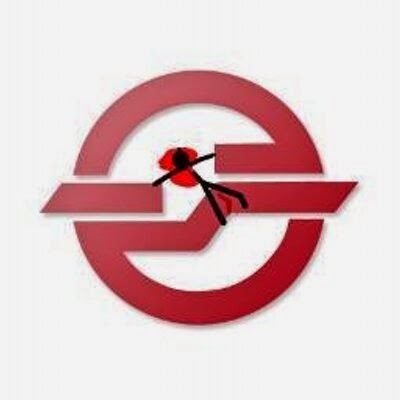 Mothership.sg said that MustShareNews covered the saga with a "defensive spin" and was downplaying it. Mothership.sg also alleged that the reason MustShareNews was doing so is that MustShareNews belongs to Gushcloud, a fact that was not disclosed by MustShareNews, thus putting MustShareNews' objectivity in doubt. 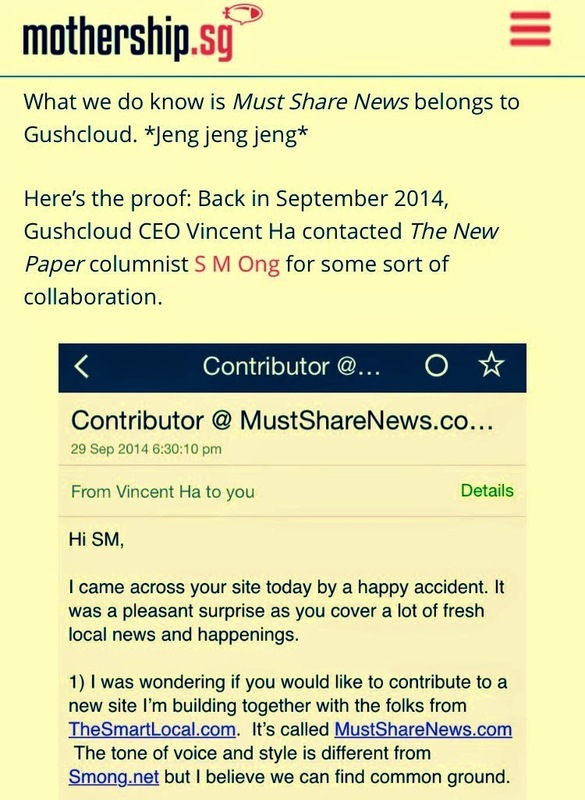 To prove that MustShareNews is owned by Gushcloud, Mothership.sg reproduced a screenshot of the e-mail Gushcloud CEO Vincent Ha wrote to me asking me to be a contributor to MustShareNews. And that was how I found myself dragged into the saga. It's my own fault for publishing Mr Ha's e-mail on this blog in December in the wake of Xiaxue's first Big Gushcloud Exposé. A part of me regrets publishing Mr Ha's e-mail because he had written to me privately and I betrayed that confidence. Publishing a private e-mail someone writes to you is not cool and I want to apologise to Mr Ha for that. I guess I was caught up in all the leaked information about Gushcloud and wanted to be part of it, even though Mr Ha's e-mail to me is really quite innocuous. That is, until Mothership.sg dredged it up as evidence that MustShareNews may be a little biased in matters regarding Gushcloud. After I blogged about his e-mail in December, Mr Ha actually wrote back to me and apologised for not responding to my reply to his e-mail back in September. He seemed to have gotten the impression that I was upset with him for that, which I wasn't at all. I was more upset with myself for giving the impression that I came up with The Noose, which I didn't at all. But now I'm a little upset about something else. So I tweeted about how surprised I was to be mentioned in Mothership.sg. And to my even bigger surprise, Xiaxue tweeted me back. @sm0ng I have printed out that cartoon of me looming over enemies and sent it to ICA to replace my IC photo but ICA rejected it. The "Goliath" thing is a reference to how I described her in my not-so-flattering New Paper column about her. The cartoon she mentioned is the one drawn by a New Paper artist to illustrate the column. You know, when I write my "funny" column about local personalities such as Xiaxue, Glenn Ong and Baey Yam Keng, I like to pretend that no way they would read it. Lately, it's getting harder to keep up that pretence. Glenn Ong has tweeted me. I went running with BYK. 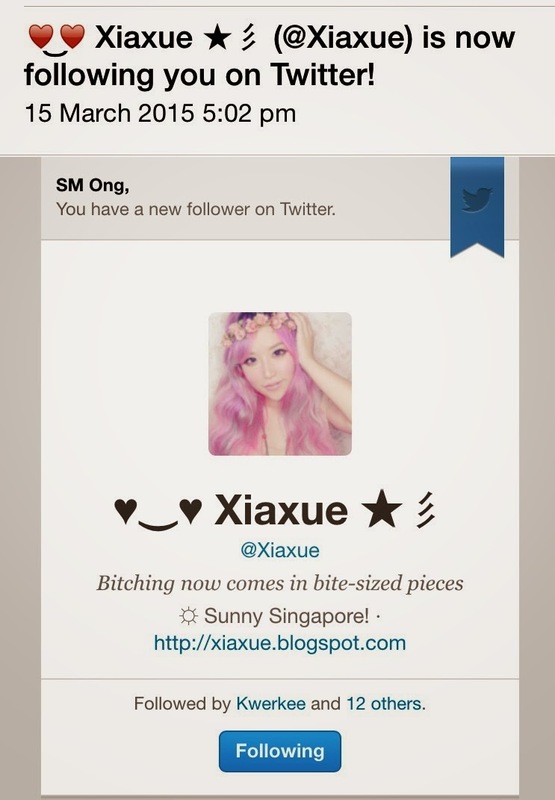 And now Xiaxue is following me on Twitter. I dragged myself into this. Now how do I drag myself out? Where's SMRT Ltd (Feedback) when you need them? Oh yah, Xiaxue filed a Protection Order against them. 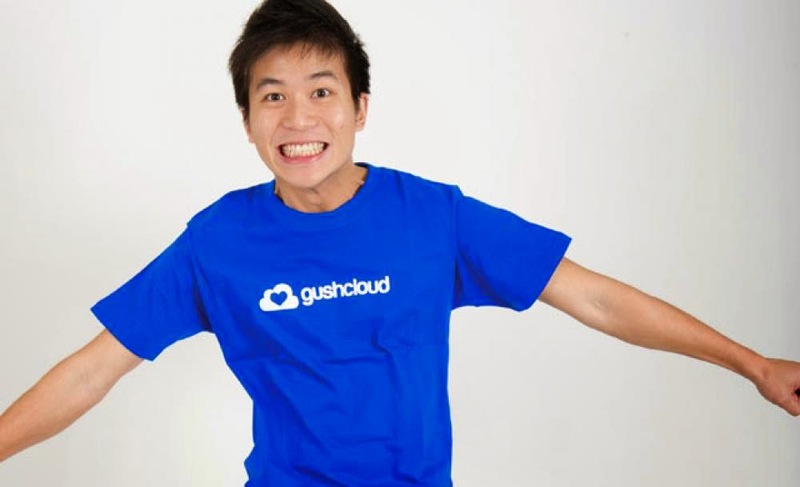 UPDATE: Xiaxue gets Singtel & Gushcloud to apologise: 'More harm than good'?